In Scanners II: The New Order, a young scanner is mentored by a police official, and reels him in by using his talents to discover the identity of someone who is poisoning milk supplies. But the official has high ambitions, and tries to control the scanner and persuade him to act illegally in getting him into a position of power, with ideas of becoming mayor. He is not above killing anyone who stands in his way, and when the scanner rebels after learning the truth, another more powerful – and more than a little crazy – scanner is dispatched to take him out. The young scanner seeks help, and learns that he has a sister he didn’t know about. Together, they attempt to put an end to the corruption, but are they out of their league...? In many ways Scanners II is a much better film than its predecessor, but, like James Cameron’s Aliens, it only works because of the fantastic innovative ideas of the original. The first movie is most known for the head exploding. This sequel has that and more; however, more importantly, it has a plot which is more conducive to a mainstream audience. 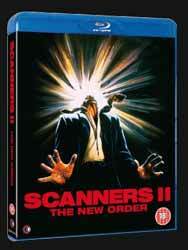 If Scanners was more about the concept, this one’s strength is in the characterisation. There are people to care about, corruption to overcome, prisoners to free, deaths to avenge... It’s a good old-fashioned good verses evil story, with realistic enough dialogue. It expands on the original idea to create an instant everyman victim to go on the run and ultimately confront the establishment.